One-third of the season gone, who are the Union? The MLS schedule for the Union this season has distorted all sense of time. Thanks to an awkward start that saw the Union play just two games in the first four weeks, plus an upcoming World Cup break that compresses the June schedule, it both feels like the season has been going on for an eternity and like a complete shock that the Union are, as of this past weekend, more than a third of the way through the campaign. Enough games have been played that we can draw some conclusions about who the Union are. They are a stingy defensive team — allowing the third-fewest goals so far in the Eastern Conference — anchored by a budding star at center back, reinforced by a young but talented defensive corps and backstopped by the best pure shot stopper in the league. They’re a team that shows flashes going forward, yet struggling to finish. With the highest-paid player in franchise history starting to settle in, the attacking spark so missing to start the season is appearing more regularly. Yet week after week it seems that they leave chances on the board, the xG-differential piling up. They’re a team still searching for a cohesive set of personnel in the final third. Their wingers have been wildly inconsistent, with five players rotating through two spots with little success. Their striker is in one of the worst stretches of form of his career, and whether he can rediscover his form from last year is the cloud hanging over a recent stretch of good play. And, yes, they’re a team that might actually grab a point or three in a road match. With that quick summary in mind, let’s hand out some awards for the first third of the season. (Yes, it’s a ludicrous exercise, but that’s never really stopped me before.) We’ll also wrap up with a quick look at the top storylines facing this team as we head into the middle third of the season — and a gauntlet of difficult Eastern Conference foes. Most valuable player: Auston Trusty. The rookie center back has been everything one could hope for and more, playing every single minute so far as the anchor of the defense. Trusty’s blend of size, athleticism, and soccer IQ is rare in any player, let alone a 19-year-old kid. While Trusty still makes some of the mistakes you’d expect, he has an uncanny ability to recover and prevent any serious danger — while only picking up two yellow cards so far. Combining with Mark McKenzie to shut down Union-killers Ignacio Piatti and Bradley Wright-Phillips is just the latest evidence that Trusty is already a star. Honorable mention: Alejandro Bedoya, Keegan Rosenberry. Most disappointing player: David Accam. When Earnie Stewart pried the Ghanaian away from Chicago Fire, few doubted that the 27-year-old with a track record of success in MLS would add a new dimension to the Union offense. Unfortunately, that dimension turned out to be the Phantom Zone. Accam has looked totally lost all season — unable to get involved in the attack and a total defensive liability — and lost his starting job as a consequence. Whether through some fault of the team’s tactical setup or some internal problem with Accam, he’s been nothing like the player Union fans were promised. Honorable mention: C.J. Sapong, Fabian Herbers. Biggest surprise: Marcus Epps. Fifth in the depth chart at the start of the year, the 2017 second-round pick seemed like an afterthought heading into the season. Yet Epps has seized a starting job for his own in the last few matches, with Accam having forgotten how to play soccer, Fabian Herbers failing to impress, and Ilsinho better suited to a supersub role. The winger’s defensive game has improved over last year, and he retains his pace and willingness to attack. To hold off Accam, though, he’ll need to add more consistent finishing to the package. Honorable mention: Auston Trusty, Mark McKenzie, Cory Burke. Biggest enigma: C.J. Sapong. Coming off his most consistent and productive year in MLS, you’d have pegged the American striker to follow up on that performance. Instead, Sapong’s play has been toothless in the extreme. His sole goal came in the first match, and his ten subsequent appearances have offered very little. Sapong is finding it very difficult to find the offense, with the “dirty work” that is essential to his game yielding little so far. It might be time for the banged-up striker to take a seat for a few matches. Honorable mention: Borek Dockal, Fafa Picault. Best result: Union 0-0 New York Red Bulls. Sure, the Union have a few wins to their name, including one outburst over Real Salt Lake. But last weekend’s draw with Red Bulls is in a different class given the caliber of the opponent. 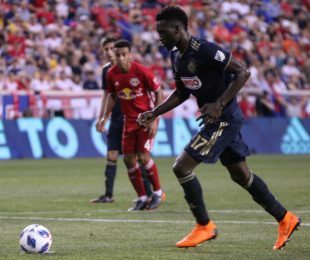 The Red Bulls have been one of the best teams in MLS all year, yet Philadelphia beat their hosts away from home at their own game, coming just a missed penalty away from taking all three points. Worst result: Union 0-2 Orlando City. The Union’s sole home defeat of the season came on national television. Handed an opportunity to challenge the narrative surrounding the team, Philadelphia instead capitulated, conceding two poor goals and then offering no fight in a punchless second half. The Stewart situation. As soon as this week, the Union may find themselves searching for a new leader, with Earnie Stewart finalizing a deal to join U.S. Soccer as general manager. Will the Union promote from within, entrusting the future to unproven Chris Albright? Or will the Union look outside the organization at someone like Ali Curtis? How a new sporting director will view the staff and roster is a question undergirding the rest of the Union’s season. Can the backline keep it up? The core of the Union so far, the youngsters in defense will face new challenges as they move deeper into the campaign. Can they maintain their form in the face of fatigue and a league starting to take notice? Will we see appearances from old mainstays Richie Marquez and Fabinho? Until the attack starts firing, the Union will only go as far as their defense can take them. Winging it. Inconsistency has been the name of the game on the wings so far this year. Will Accam ever round into form? Can Epps and Fafa Picault cement their starting spots? To me, the intriguing option is Ilsinho, who’s looked lively in reserve action. I don’t think CJ is an enigma. I think he is a mediocre striker who had a career year last year. He has the best year of his Career last year when he was 28. He wasn’t some young kid breaking out, he was a known commodity having a career year. He has since returned to the average, which we are familiar with from his years with us before last year and his years in SKC. I hate Curtin’s love affair with him and it seems like a lot of people were tricked by a career year yet again. You win 1/3 season award for using the word “career” as many time as possible in one post. Great insights, Pete, especially on how successful our defense has been. I think I can agree with all of your early season superlatives except for worst result, which I think is letting DC earn a draw against you at home. But I think it might be a toss up with your points on how pathetic the Union were against Orlando. Did they? Oh man. My memory is fantastic. What I see is that this is a team that is starting to gel. It took awhile for Dockal to mesh with his teammates and for Epps to come on which allows Picault to play on the left, but if they can continue to play the way they’ve been playing we could see a team push to the playoffs. We should definitely see some significant squad rotation next Tuesday, especially given the increased restriction on non-US players (although some of the players I’d like to see more of next Tuesday, Accam and Elliott probably use up part of the non-US quota). I’d really like to see a midfield of Jones-Fontana-Najem for the open cup game. CJ can start that one too because he shouldn’t start another MLS game for a while. In the first 1/3 of a season, the league has 10 “good” teams (defined as >1.5 ppg). We have played four games against them. In those four games we have 0 goals and 1 point — from NYRB this weekend. Against the bottom half of the table, the Union have scored 1.38 goals per game and gone 4-2-2 for 14 points. In other words, this is a team at the top of the bottom half of the table. And the sad thing is that level of barely adequate is the best we can hope for. Coming out of a mania with the proper selective seretonin reuptake inhibitor? To beat the same drum yet again, when has anyone seen David Accam outrun a defender to a ball while wearing a Union shirt? Chicago knew what they were doing when the unloaded him. The elite speed is gone. Find it hard to believe that a 27 year old player has lost his speed. I think he benefited from the attention that was focused on Nikolić last year and isn’t getting that with Sapong who’s in a horrid slump. I have a feeling Accam is going to get the start against Chicago replacing CJ. Just a hunch though. I’ve wondered the same thing. Have yet to see the “burst” that used to decimate the Union, among others. The first game he was flying past NE consistently, and they have a pretty speedy RB that has shut Piccualt down in the past. Ever since nothing. What makes Trusty’s performance even more remarkable is that he’s playing behind central midfielders who have zero defensive athleticism (Haris), are always drifted to the right wing (Bedoya) and are playing as a second striker (Dockal). It’s not like he’s getting his feet wet while getting screened by Beckerman, Bradley, Felipe or Chara. He’s been in the deep end all season. Accam had one good game this season, his first match. Sapong is not talented enough to be a lone/target man striker. If our back line is skilled enough like we agree, then the problem lies first in the midfield and then the forwards. I feel like Bedoya is better fit as an RM, like his best stretch with the USMNT, and not in centre midfield. Dockal hopefully is settling in (I don’t know why we always make a dramatic, last-minute signing each season. It only causes disruption). After missing that penalty, Sapong should sit, no question about it. Let’s see tonight if Curtain doesn’t have his head completely up his arse.